This entry was posted in Seasonal and tagged daffodils, fortelling spring, rebirth. Bookmark the permalink. A lovely picture and what wonderful words to accompany it! 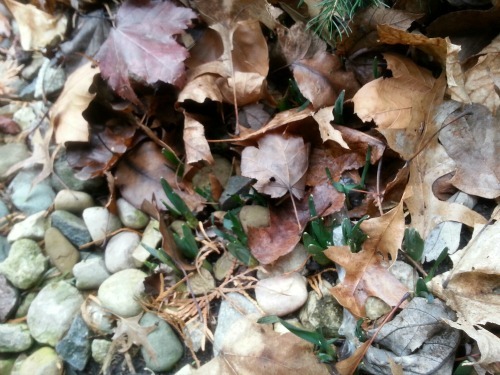 It’s hard to believe Daffodils are brave enough to peek out when it’s thirty degrees outside! I feel like they need a blanket or something. I have always admired the bravery of flowers. But a blanket would be just perfect! Those stones are awesome. Pick them up for your slingshot. Agh! You and Domer just love rocks, don’t you?? He spent most of his time gathering rocks when he should’ve been more concerned about somebody hitting a long drive to outer field! *laughs* I love rocks! Have a whole collection, in fact. Why doesn’t that surprise me?? Domer has buckets of them — special rocks, he used to call them! Well I’m sure they are special! It takes some hunting to find the right ones. I hope these don’t succumb to the cold. Nothing says Spring like daffodils! I used to love crocus for their daring do. Oh, I love crocus, too. Such a delicate shade of lilac! Debbie, I love that quote! In fact, I read it three times before leaving this comment. Beautiful photograph too! This has been the strangest winter for us. One day it’s warm and spring-like, the next it’s cold and snowing. The poor little flowers don’t know what to do. Have a super Thursday, my friend! Thanks, Ron. You know, it’s a wonder more people aren’t sick this winter, what with the weather being all over the place! I can’t say I mind having a warmer winter than usual though — ice isn’t my favorite thing, ha! I can hardly wait for these daffodils to bloom. Of course, it will be weeks…no, more like months…before they do! Actually, snow covered flowers have their blanket: the snow itself. Wet, heavy, packed snow doesn’t do quite so well, because it’s lost the air spaces between flakes. But a nice, fluffy snow? Those flowers might as well be wearing goose down jackets. I remember how exciting it always was to see the early flowers peeking up: tulips, daffodils, and such. It’s just about time for our cold weather flowers to emerge. I’m ready. Thanks for the reminder to start looking. I’m just pea-green at this time of year, Linda! You southern folks have the BEST weather, with its early springs and calm winters. We won’t even mention hurricane season, though, which I’m sure most people could easily do without! Absolutely — start looking for signs of spring. Something about these hardy flowers that spells “hope” to me! Isn’t this true? Is it because we’ve waited so long for just a tease of sunshine and something green and alive? Well, I’m the kind who likes snow between Christmas and New Year’s Day, then it can go away until the next year, ha! Sadly, I can’t seem to find any place with that kind of weather!